Hitching or hitchhiking in Maui, Hawaii and all of the Hawaiian islands is illegal. Though hitchhiking is common place on the islands, you can still be arrested for thumbing a ride along any road in Maui. The crime rate is low here, and people regularly use this practice to get around the island. It is relatively safe to do so, though we recommend you use caution and your intuition when picking up hitchhikers or hitchhiking yourself. Ladies should especially be careful. Yes, crime rate is low, but there is a lot of drug use in Maui. Ice has become a serious problem among the Hawaiian Islands, so keep this in mind when getting into someone's car that you don't know. 1. Use the power of Aloha. So long as you're cheerful and respectful, you'll get a ride. 2. Don't give bad looks to those that don't pick you up. You have no idea what their circumstances are at the moment. 3. If you're clean and appear to be harmless, you might get a ride. 4. Look for local vehicles. Tourists in rental cars are less likely to pick you up. Most visitors to hawaii come from places where hitchhiking is frowned upon. 5. Don't use your thumb. If you use your thumb out, you can be arrested. 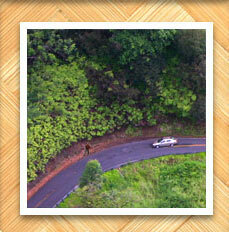 The Maui Police are usually pretty leniant about hitchhiking, and often will only issue you a warning. But it is illegal and you would be opening yourself up to being arrested. Stand on the side of the road with your arms crossed, and a local will soon pull over, knowing what you need, and offer you a ride. 6. Use Proper Hitchhiking Ethics. This is a commonly misunderstood thing. Some people believe that in Maui you should walk with your thumb out. In Oahu, you should stand facing traffic and keep your arms in. We think this is the belief possibly because Oahu is stricter about hitching than on Maui. Either way, we believe that you should use the Oahu approach if you choose to hitch. This way you're less likely to get in trouble. If you're picking someone up and have a truck, insist that the hitchers stay in the truck bed. This is also common place in Hawaii, and will keep you seperated from them if they are dangerous. Most hitchhikers understand and are used to it. They'll just be happy to get a ride. Again, we don't recommend you hitch on any of the islands. It's best to spring for a rental car in Maui and go where you want when you want to. Maui has many good priced rentals that are easily reserved. We've found that 3rd party resellers have the best prices and largest selection. If you use one of these companies, you'll be given the lowest rate for the car you want. They search through all the rent a car companies on the island and get the best deals. Also, you don't need to use your credit card with some of the services. They'll let you make the reservation without entering your secure information over the web. This is a major plus. Just recently, one of our editors witnessed a horrific car crash with a couple local guys trying to pass a truck. They launched through the air and somehow survived. The wreckage was a mess of broken glass, car parts, and beer cans. At 8 in the morning, you don't expect to see people drinking and driving, but after their long night of doing drugs, this seemed rational to them. Almost as horrific, I once picked up some hitchhikers in Hana. They seemed like nice clean looking guys, but once they entered my car, the stench was horrible. I was right about them being nice, and they appreciated the ride. After they'd gotten out, the smell lingered for days. Some of the people who regularly hitch hike are also camping. This means no showers.